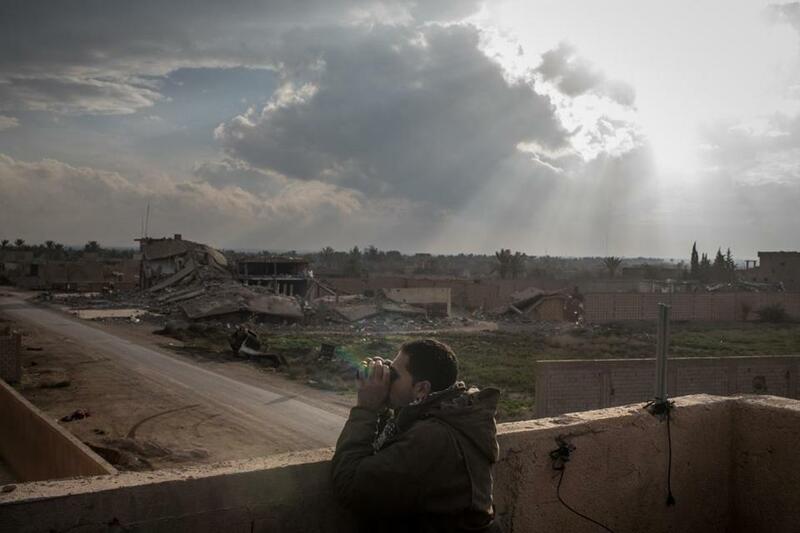 A Syrian Democratic Forces commander looked for Islamic State positions from a rooftop near the front line on Sunday in Baghouz, Syria. BEIRUT — Islamic State group militants cornered in their last foothold in eastern Syria fought back with suicide car bombs, snipers, and booby traps Monday, slowing Kurdish fighters advancing under the cover of US-led coalition airstrikes, Kurdish news agencies and a Syrian war monitor said. An Italian photographer was wounded in the clashes between the US-backed Syrian Democratic Forces and the militants holed up in the village of Baghouz, near the border with Iraq, an Italian news agency said. The Syrian Democratic Forces on Saturday launched a final push to clear the area from the Islamic State, after months of fighting that saw 20,000 civilians fleeing just in the past few weeks. The numbers have overwhelmed Kurdish-run camps in northeastern Syria, where humanitarian conditions are already dire amid a cold winter and meager resources. The capture of the Islamic State-held village of Baghouz and nearby areas would mark the end of a devastating four-year global war to end the Islamic State extremists’ territorial hold over large parts of Syria and Iraq, where the group established its self-proclaimed ‘‘caliphate’’ in 2014. That in turn, would open the way for President Trump to begin withdrawing US troops from northern Syria as he has promised to do once the Islamic State group has been defeated. ‘‘The U.S. will soon control 100% of ISIS territory in Syria,’’ Trump tweeted Sunday. He has said repeatedly that he doesn’t want the United States to be the world’s policeman and that he intends to bring the 2,000 US troops home. In recent weeks, US officials have said the Islamic State has lost 99.5 percent of its territory and is holding on to under 2 square miles, where most of the fighters are concentrated in Syria. But activists and residents say the Islamic State still has sleeper cells in Syria and Iraq and is laying the groundwork for an insurgency. ‘‘This [American] pullout will leave a huge vacuum despite the allegations of defeating the last pockets of ISIS. This vacuum will increase the international and regional struggle for power and influence in Syria,’’ he said, which in turn may make it easier for the militant group to return. It is not clear how long the final push to free Baghouz from the Islamic State will take. Trump said last week he had been told that the full territorial conquest to defeat the Islamic State could be completed in the coming week. But progress appears to be slower than what Syrian Democratic Forces officials had initially estimated. The Syrian Observatory for Human Rights said the Syrian Democratic Forces were moving very slowly due to land mines and sniper fire, as well as the extremists’ use of tunnels and suicide car bombs. The Islamic State also is using civilians as human shields, the Observatory said. On Monday, the Observatory said 13 Islamic State militants, including five suicide attackers, were killed as well as six Syrian Democratic Forces fighters. The Kurdish Hawar news agency also reported heavy fighting in Baghouz. The Islamic State said in a statement posted late Sunday that two of its ‘‘martyrdom-seekers’’ attacked Syrian Democratic Forces fighters in Baghouz with their explosive-laden car. Syrian state media claimed a US-led coalition airstrike near Baghouz killed two women and two children. More than 20,000 civilians have left the Islamic State-held area in recent weeks.